Pittsburgh - Here on this last day of August the home town Bucs were facing off against one of their Division rivals, the New York Giants in the second of a four game series. Having lost the first game on a ninth inning single that traveled no more than sixty feet, six inches, the Buccos were prepared to battle right to the end once again. And Walsh himself had been a victim of a ninth inning rally while losing his last start by a 1-0 score at Keokuk in his last time out. So nobody was looking at this as just another game. Luckily for them, spit baller Eddie Walsh made things very easy for them. But today, no last minute rallies were forthcoming for the Giants, nor were they needed for the Pirates either. The Bucs tallied three runs in the third with one of their typical rallies - a collection of extra bases hits bunched together. 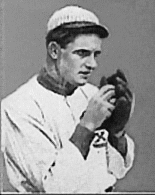 The big blows today were a two run Pop Lloyd double and a long triple by relative new comer Big Ed Delahanty. That was all Eddie needed. In fact, he didn't need nearly that much, for today Mr. Walsh was Mr. Perfect. You read that correctly. He was perfect on this day - 27 Giants picked up their lumber and strode to the plate today, and 27 lugged that piece of wood back to the dugout, having made out. There were no Randy Johnson fireworks involved - he only whiffed two Jints on the day - but he simply put the batters quietly aside one after the other, until there were no more batters left to conquer. Walsh's perfection seemed almost efortless. The first perfect game in ATL history, and third no-hitter overall was in the books after just 80 pitches from the Pittsburgh hurler. With the Mets hanging tough, and the these same Giants making a charge themselves, this game was no meaningless contest, either. The Bucs needed to keep winning, and Walsh did his part - to perfection. Temperature: 82, Sky: partly cloudy, Wind: in from right at 14 MPH.